Looks like the holidays are going to be rough for blogging. Don’t worry I’m still not having trouble finding the time to drink wine, just to write about it. Speaking of fantastic wine I’ve drank lately, Myles and I shared our first Burgundy last weekend while out for our first date in a long, long while. It was a-m-a-z-i-n-g. It was a 1996, and perfectly aged. It was also my first experience using the services of the sommelier- which was also pretty great. Its just like all the books say, tell them what you want and how much you can spend and they will lead you to the perfect wine! But, I digress. 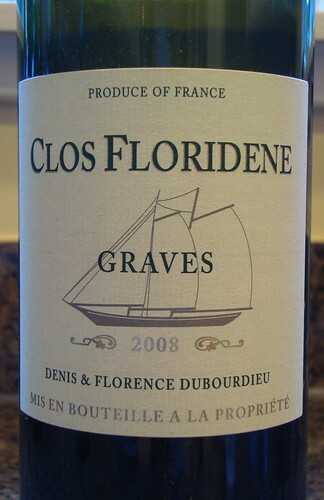 Earlier this week, before I started stuffing myself with turkey, we drank the 2008 Clos Floridene, which is from Graves. My handy pronunciation website doesn’t have just “Graves” but “". I think that’s a place (which isn’t in the wine appellation of Graves either), but it’ll give you the right idea. This is the last white Bordeaux, so it’ll be all red for a while after this. This wine was a light straw yellow. As I often do, I smelled bananas and a little lemon. I had it stuck in my head that this was going to be a sauvignon blanc based wine, even though I know that there are others allowed, probably because the other white Bordeaux was primarily sauvignon blanc. It wasn’t until I’d finished my tasting notes that I realized the obvious. At any rate, I thought it tasted a tad sweet, though with an acidic backbone. It wasn’t sugar sweet (it's a dry wine), but tasted of apricots and peaches, which are such sweet fruits. I was surprised that I tasted no citrus. I shouldn’t have been. I wrote down that it was such a full wine, almost like a French pinot gris. And that was when I realized... it was semillon. Wow, I’ve been so busy lately that I have two wines to write about. Luckily, I haven’t been too busy to drink wine. I can multi-task! Both of the wines are from Pessac-Léognan, which is a sub-appellation of Graves. The area is located just south of the city of Bordeaux. This is a full service wine education blog, so to help both myself and the rest of us that cannot properly speak or pronounce French, here is how you say . It is said that it was in Pessac-Léognan that fine red wine was born 450 years ago at Château Haut-Brion. (Which is also the only classified first growth from the 1855 classification outside the Médoc.) This area of Graves is dominated by pine trees, apparently the vineyards are clearings and can be heavily isolated from each other. And while red wine is the primary type produced, most château also produce high quality white wines as well. Another interesting tidbit is that Château Haut-Brion is owned by Americans (! ), it was purchased in 1935 by Clarence Dillon when Bordeaux wine production was so unprofitable that it wasn’t the only first growth for sale! Now his descendants own four high end château in Pessac-Léognan: Château Laville Haut-Brion, Château La Tour Haut-Brion, Château La Mission Haut-Brion, and of course, Château Haut-Brion itself. The red I tasted for this region is the second wine of another château in the area with in the name (good thing they named all the château around here with completely different names so we could easily keep track, right? 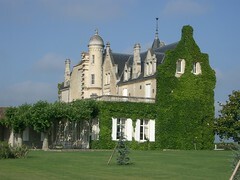 ), Château Larrivet Haut-Brion. 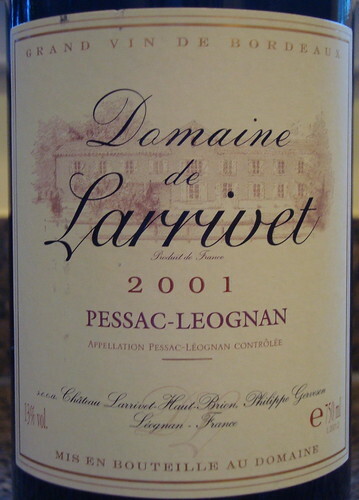 Under the name of Domaine de Larrivet, this wine was quite the bargain. So, what is a second wine (or in French, second vin)? It's very common in Bordeaux for a winemaker to make wine out of younger vines or certain vineyard plots, which he/she will ferment and age separately. Some of the wine goes into the Gran vin, the rest into the second vin. Its a great way to get good wine for less money- the wines are both made by the same winemaker using the same equipment! The Domaine de Larrivet was certainly a bargain, the cheapest Bordeaux I bought at only $16.99. Not bad for a wine that’s spent the last nine years aging! The wine is half cabernet sauvignon and half merlot. In the glass it showed its age being a dark reddish brown color, very maroon for a wine. It had a very smoky nose, also smelling like cassis, nuts and wood. It had a very smooth texture, most likely from the very mellow tannins. I tasted bacon (or maybe Myles and I had just been discussing bacon before opening the bottle!) as well as black pepper and oak. It had a long finish. Hands down the best “cheap” red wine I’ve had in a long, long while. 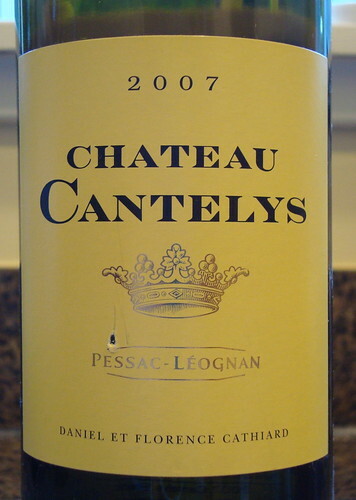 The white wine, from Château Cantelys, is primarily sauvignon blanc. It was super pale yellow and smelled of lemon, peach and was even slightly floral. It had good acidity, and tasted citrusy (as I have come to expect from sauvignon blanc) and even a bit like green apple. Perhaps the only twist is that it also had a hint of oak. Unlike sauvignon blanc that I typically drink, this one was aged for a bit in oak. Still quite tasty! Since I’ve been at this for about four and a half months, its time for a check in on my progress. Or rather, something that I read in Secrets of the Sommeliers made me realize that my approach thus far has been wrong. Completely and totally all wrong. The book advised that if one is interested in learning about wine, how it tastes and recognizing wine in a blind tasting one should first taste wine from the classic regions. My haphazard approach has really done nothing so far as educating my palate. In fact, I’ve probably just confused it! So, what are the classic regions? They center around France, of course. And also include Germany; Austria; Piedmont, Tuscany and the Veneto in Italy; Rioja, sherry and Albarino from Spain; and port and vino verde from Portugal. Also considered classic are New Zealand Sauvignon Blanc, Napa Valley Cabernet and Oregon Pinot Noir- the only New World wines that have been elevated to this status. I was off to a good start back in July, beginning this quest with Alsace, France. But, then I blew it. So, to make up for it I’m going after what is probably one of the most confusing, complicated, infuriating, expensive and famous wine regions in the world. Bordeaux. Pay close attention now, this is about to get tricky. And French. Let’s start with the geography lesson. The name Bordeaux is derived from ‘au bord de l’eau’, which means ‘along the waters’. The region straddles three important rivers, mainly the Gironde and the two rivers that feed it, the Dordogne and the Garonne. 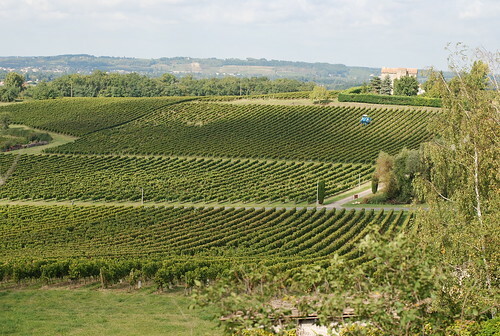 French AOC (Appellation D’Origine Contrôlée) law dictates everything from vineyard borders, grape varieties allowed, alcohol levels, labeling and more. Bordeaux has 57 AOC regions, however only four of them stand out: Médoc, Pomerol, Graves/Pessac-Léognan and St-Émilion. But just to make it extra fun, the Médoc actually has multiple sub-appellations including Haut Médoc, St-Estèphe, Pauillac, Margaux and St-Julien. Also remember that Sauternes is in Bordeaux, although I already covered that in a previous post/tasting. Next for the history lesson. 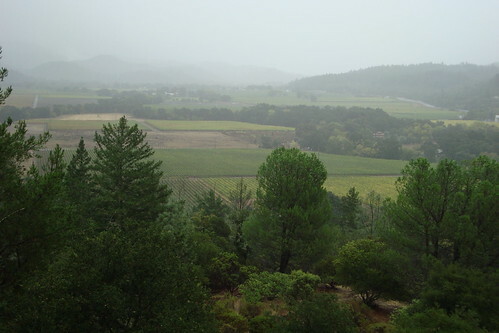 Within many of the regions the various wineries, or château, are classified using various systems, the best well known of which is the 1855 Classification. France was sending wines to represent the country at the International Exposition that year so the top Médoc wines were ranked according to price (which equated to quality). Sixty-one Château were ranked from 1st growth through 5th growth: five 1st growths, 14 2nd’s, 14 3rd’s, 10 4th’s and 18 5th’s. 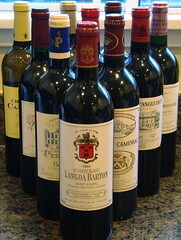 There’s also a series of château classified as Cru Bourgeois in the Médoc. Last updated in 2003, there are 247 château on this list. Other classification systems exist for Graves (Grands Crus Classé) and St-Émilion (Premiers Grands Crus Classés and Grands Crus Classés). Still with me? So, for the wine. Both red and white wine is made in Bordeaux, though close to 90% is red. Each year somewhere between 60 and 70 million cases of wine are made, among them some of the most expensive wine on the planet. Red Bordeaux wine (also known as claret) can legally contain only cabernet sauvignon, merlot, cabernet franc, petit verdot and malbec, the latter two are used only sparingly, if at all. White wine can contain sauvignon blanc, sémillon, muscadelle and ugni blanc, again with the last two rarely used. Since the grape varieties have been defined in the laws they are not on the label. Its illegal to put them on the label. So, it’s helpful to know that “left bank” wines (Médoc, Graves/Pessac-Léognan) tend to be primarily Cabernet Sauvignon and “right bank” wines (St-Émilion and Pomerol) tend to be primarily Merlot. Ready to go buy some Bordeaux based purely on the labels? Yeah, me neither. 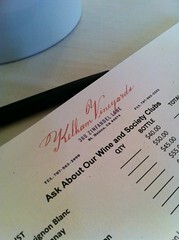 Feeling an immense amount of pressure to choose the right wines, I conducted hours of research before heading to K&L. Its not like I can afford a first growth wine (futures of the 2009 Château Lafite-Rothschild, a first growth in Pauillac, are going for $1,599. A bottle. ), but these wines are going to be my first ever Bordeauxs and I want to be sure I pick wines that are both representative of the specific regions, as aged as I can get them (no younger than 2005 for the reds), and less than $50 a bottle, preferably a lot less. So I did what any reasonable person would do. I got out Kevin Zraly’s Complete Wine Course book, turned to the Bordeaux chapter and searched for every single Château he mentioned. I made a list of all the appellations I wanted represented (that would be nine) and all the possibilities K&L had. Based on Zraly’s vintage charts, wine descriptions and prices I finally narrowed it down to 10 wines (I have both a red and a white from Graves). Yep, this means we’ll be tasting, learning about and discussing Bordeaux in great detail until January! I was pleased to discover while reading my latest wine book, Secrets of the Sommeliers , that this wine is made by a sommelier and his wines were listed in the book- which is written by a quite famous sommelier. For some reason, after reading the book, I really trust his judgement. So much so that I made reservations for later this month at the restaurant he owns with Michael Mina in San Francisco. After I try a wine from his hand picked list we’ll see if I’m still in agreement! But, back to this syrah. Its pretty young for a red wine, so I poured it through my Vinturi first to make sure it was nice and aerated. It was a dark purplish color with ruby edges. On the nose it was spicy, and smelled strongly like pepper. I also found a hint of anise. It tasted very peppery as well, and not very fruity, although I believe that’s pretty typical of syrah. The wine is actually 95% syrah and 5% viognier, which is a white wine. I thought I could sense it in the wine. Viognier is a very distinctive wine, aromatic and flavorful. I also tasted a hint of wood in the wine. At first Myles and I didn’t love it, but the more I sipped, the better it got. One of the things the book said about sommeliers is that they don’t like the big, powerful wines that often get high scores from wine critics. They tend to be too bold and high in alcohol. Wines like that go terribly with food. And what more is their job than to help choose wine to drink with food? Therefore, when they make wine themselves they strive to make lower alcohol wines that go well with food. I saved much of my glass to drink with dinner. We were having homemade macaroni and cheese that night, which actually turned out to be a great match! We went to Napa, with our children, for three whole days and it was quite a fabulous time (minus the two straight days of pouring rain, of course). I wanted to write about a couple of the highlights. First: Kelham Vineyards. Oh. My. God. Back in September, shortly after we decided to make this journey up to wine country, a friend was up there and found himself at Kelham on the good word of several tasting room employees. He raved. I made an appointment, six weeks ahead of time. I warned we’d have the kids. When we arrived it was pouring rain, so we sat inside. Kelham is a family winery, so Susan and Ron Kelham (mother and son) were working the room and pouring wine. Connor (my older son) even got to play with an old tractor set that belonged to the Kelham boys when they were kids. The first thing to notice is that while they’re pouring the current releases the vintages are much different than what you get just about anywhere else. First up was the 2006 Sauvignon Blanc. Partially barrel fermented, aged in the bottle for years and undoubtedly amongst some of the most delicious wines I’ve ever tasted! The only “young” wine they poured was the 2008 Chardonnay which they make only 140 cases of each year to drink on Thanksgiving. I would happily eat Thanksgiving dinner every day just to drink that wine! We tasted a few merlots and then came the cabernets, first a 2003. Quite good. Then they poured the 2001. I believe my exact words were “Holy crap!”. Probably one of the, if not the best wine EVER. Ron, and his brother Hamilton, happen to be the wine makers, and so do I take the opportunity to ask Ron an intelligent question? Nope! Like a crazed fan who finally meets her celebrity idol I say something like “How do you make it so yummy?”. Luckily, my stupid question still received a great answer. He said the secret is using super high quality fruit and bottle age. 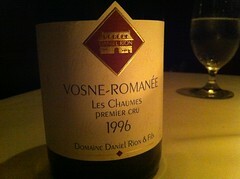 Most of the greatest fine wines in the world aren’t released until they’ve aged for ten, maybe 15 years, he explained. Now I know why! My wine cabinet is going to get crowded as I wait for all my cabernets to age at least nine years before opening them! He also said they really strive to make wine in the old world style, rather than the fruit forward new world style. Other highlights of Kelham: Picnic the cat who sat on my lap, the three other dogs that roamed the tasting room (and appeared one by one as a new wine was poured as if on purpose! ), and two well behaved boys! 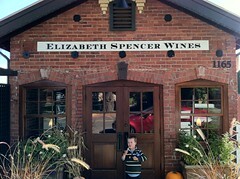 Another highlight was at the Elizabeth Spencer Harvest Event. This was what convinced us to make the trip in the first place. An event at one of our favorite wineries on our anniversary weekend? Sign us up! 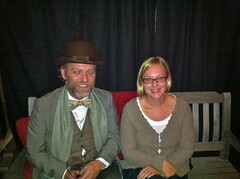 Myles and I (we left the kids with a sitter!) had the pleasure of chatting with Matthew Rorick, the winemaker at Elizabeth Spencer as well as his own label, Forlorn Hope. He was a super friendly guy and answered my burning questions (such as why does ES not make any blends?). He was also looking quite dapper for a guy in the middle of crush! Myles claims that I really sounded like I knew what I was talking about when it came to wine, so maybe this education is getting me somewhere! We also had the chance to talk with Elizabeth Pressler, one of the owners. She was fun to chat with and loved to hear our story about how we discovered the winery. Even more fun was seeing her again on Monday when we just couldn’t resist stopping by again with the kids after lunch at Rutherford Grill. It's so fun to meet the people behind the wine. It's no coincidence that our favorite places are small and NOT owned by some corporation.